Now released for the first time ever on DVD. Despite the vintage, sound and picture quality is excellent on this studio recorded set...What appear to be very contemporary interviews with Maggie Bell and Colin Allen add value...All things considered, as good a DVD debut as any of their fans could have hoped for. 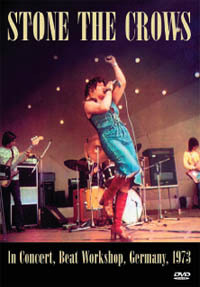 Maggie Bell was one terrific, bluesy rock singer and this concert captures her and the band at their peak in a 1973 German performance... Bonus material here are interviews with Bell and drummer Colin Allen, who joined the Crows after being in John Mayall's Bluesbreakers. There also is a history of the band by Rich Wilson. ...a 13 song DVD that captures Bell and her Midnight Flyer band - bassist Tony Stevens, guitarist Ant Glynne, drummer Dave Dowle and keyboard player Chris Farren - at their dramatic peak. ... a decade on from her emergence aboard Stone The Crows (also the subject of an excellent Angel Air DVD), Bell remained one of British blues' most scintillating performers.